To begin, I’ll admit Red isn’t a band I’m a really big fan of. They have some incredible songs and some songs that just don’t grab me. When their newest album released to critical acclaim, I thought I’d check it out and see what all the hype was about. At first I wasn’t too keen on it. It was very long (it clocks in at just over an hour) and nothing really stood out. But I decided to look at the album and its concept as a whole, and that’s when the greatness of this album began to shine through. 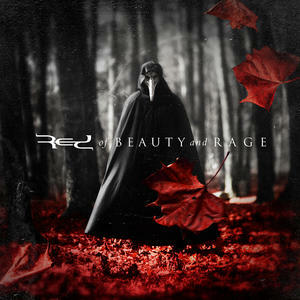 Red uses a blend of strings, piano, guitar, and of course Michael’s intense singing and screaming to create a sound that’s all together beautiful and heavy, as the album’s title suggests. Altogether, with the screaming guitars and vocals coupled with the strings, they bring a heavy, dark atmosphere to the album that’s almost tangible. In fact, this is one of the darkest albums I’ve heard in a good while, and it’s not just the music either. Of course, that’s not to say this whole album is dark. What would be the point of that? Of Beauty and Rage is a tale of redemption from the darkness which lives inside of us, and that darkness is our addiction to sin. So while the first half is dark and brooding, the second half, especially the final three tracks, brims with hope and light in God’s love. The album tells a story that begins with a slow instrumental called Descent. It’s a creepy beginning that sounds like we’re being lowered into the depths of some dark forest. That then leads into the album’s opening song, Imposter. An intense beginning about how we see the things of this world as our savior and them betraying us in the end. Tell me you were never really real, you need another soul to steal, you’re my imposter. Shadow and Soul, track three, blasts through the gate with thundering riffs. This song is all over the place musically, with a string led chorus that is just beautiful, and when we enter the second half of the song it completely shifts gears where it focuses on a sole piano and falsetto. Track four, Darkest Part, was the first single for the album. It sings of the broken condition of our souls and the fear we have of someone seeing inside. A fear I think we can all relate to as we try to hide our true selves from those around us, and from God. Here’s the short music video, but there’s an eight minute version on youtube if you’d like to see the whole story. Skipping ahead to track six we have Of These Chains, the first and only ballad on the album. It consists of nothing but haunting piano and strings, and Michael’s vocals really shine in this track. While I adore the heavy side of the album, this track is probably my favourite. It shows the conflict of wanting to move on, but not wanting to leave old habits. Can I just hold on? Falling Sky, another favourite of mine, is an intense song of hopelessness and terror as our unnamed protagonist watches his world crash around him; and after a short instrumental, he sees his need for God in Yours Again. This song is the first track where we see hope begin to rise. God meets our protagonist head on and it’s a beautiful collision. While Yours Again is hopeful, it is then countered by the darkest track on the record: What You Keep Alive. After we find God, sin strikes back in a final attempt. It speaks from sin’s point of view, with lyrics such as You keep me alive so I can hurt you, you need me inside, I’m what you keep alive, you picked me up, you watched me shine, like a razor in your hand, and when I cut beneath your skin you want it all again. It’s a strongly convicting song and it doesn’t shy away from sin’s true nature; which is refreshing because the problem with a lot of Christian music is that it avoids most uncomfortable topics and serves only as a medium to feel good, so it sadly lacks conviction (of course that music has its place, but where’s the light without the dark?). Though because of the song’s nature it might be too much for some. On it’s own, it’s definitely a disturbing listen. The story then continues with our protagonist realizing the danger of sin’s hold, and in turning to God, finally feels himself breaking away in the next track, Gravity Lies. Now we’re in the climax of the album. The final act of songs, Take Me Over, The Ever, and Part That’s Holding On, overflow with hope, light, victory, and God’s abounding love and grace. Take Me Over, a more pop sounding song than what was heard beforehand, sings of complete surrender. The Ever collides the heavy side with a hopeful realization of God’s love. But you saw more, you saw the deepest part, with the light of a thousand stars, you saw them awaken me…./you woke me up inside, brought me back to life, I lost myself, but now I breathe again. The album then ends with Part That’s Holding On. Our protagonist, now free from sin, desires to bring the ones he loves into the same freedom, and the anguish and pain he feels when they slip away. In the end it shows that he will never give up. I gave it all, but you were fading, where’d you go, all alone, I couldn’t see. Not the fall, through the dark, of our shadows, I reach for you, only you, but still apart, a part that’s holding on (I can’t help but think of a youtube comment that said it’s the perfect flashback for Obi-Wan thinking about Anakin after he turned to the dark side, and Anakin being free in the end because there was “a part that was holding on). Red then gives their bow with an instrumental titled, Ascent. Unlike Descent, which lowers you into the darkness, Ascent feels like falling into the arms of the Father, resting in the peace of His love and goodness. Overall this is one amazing album. The story from darkness to light is well displayed, and each song doesn’t try to stick out, but each moves the story along efficiently. Yes it’s style may not be for all (in my opinion, considering the story it tells, no other style would do it justice), yes some of the songs do end up sounding similar, but if listened to closely, I believe it will truly bless you. It’s a cinematic experience from beginning to end, and one the guys of Red should be proud of.